The Volkswagen Polo combines a comfortable ride with secure handling that is going to make getting to wherever it is you are going a cool and comfortable drive. It also has one of the classiest interiors of any supermini available on the market today! It seats 5 and has a convenient 5 door set up for quick and easy access to any part of the cabin or cargo area. 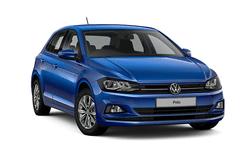 The Volkswagen Polo is one of the most popular models in its class is among the more popular vehicles we offer. Make your reservation today and enjoy great mileage, advanced safety features, and comfort that makes any drive a pleasant one. Check it out for yourself and drive away in a Volkswagen Polo Diesel today!